Architecture and urban planning was also a way for Argentina to show off to the rest of the world that this was no longer a colony, but a great and prosperous nation. And so the government commissioned French designers to build some of the country’s most important buildings, deliberately employing the typically intricate, delicate and imposing French style to show the world and its colonizers just how far they had come. If you want to see an example of this French, showboat style then head to the Estrumagou building (photos 56/57), Juncal 783, in Retiro neighbourhood. The first wave of French architects came over to Argentina in the 1820s, just a few years after independence was declared. This edifice, however, was built much later on in comparison with some of the other French baroque-style structures, which just goes to show how enduring the French influence has been in Argentina and, particularly, in Buenos Aires. Finished in 1929, the Estrumagou building is a breathtaking, eight story structure that is made up of white stone, delicate balconies and topped off with a French, or mansard, roof that is typical of French Second Empire architecture. The design of the Estrumagou building doesn’t just mimic French styles, but many of the elements and materials were imported from France to give it an authentic elegance. The floor is even made of Slovenian oak. 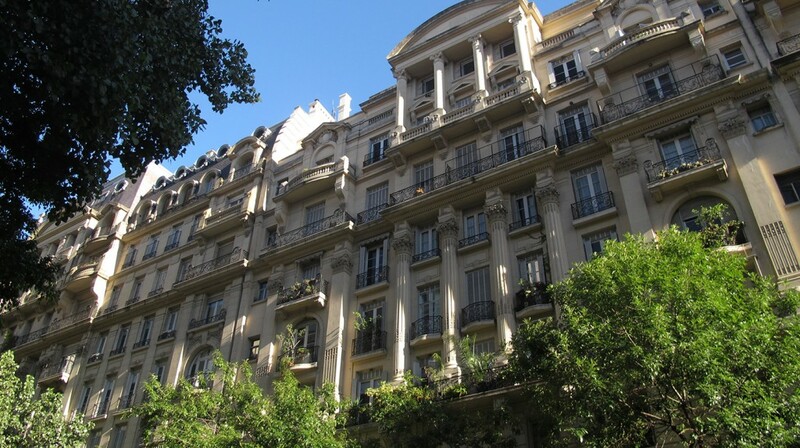 When you see buildings like the Estrumagou, you realize why Buenos Aires is called the Paris of South America. Staring up at this building you really will feel like you’re on a street corner in the French capital. Argentine architecture reveals a lot about the history of this Latin American nation, so what better way to explore the city and its history than to to go visiting all the architectural highlights of the city?